A&D Australasia’s Inspection Systems Division was recently approached by Reynolds Group Ltd, one of New Zealand’s leading suppliers of complete end-of-line solutions for the manufacturing sector. Reynolds Group has an enviable reputation for delivering world-class industrial technology with complete, turn-key systems, so they expected nothing short of a premium solution. Supply an end-of-line weighing system that can weigh 10kg of whole capsicums packed in reusable plastic crates or cardboard boxes. Intelligent storage of product information with easy extraction for quality assurance. The checkweigher needs to easily integrate with existing established lines and equipment. System design needs to be robust with food grade stainless steel (easy to clean and maintain). System controls including the large colour touch screen interface needs to be user-friendly. Using A&D Japan’s popular touch screen intelligent checkweighing controller, the A&D Australasia design team went to work to produce a high capacity checkweigher. The complete system – which consists of an infeed conveyor, weighing conveyor, control unit, and a push ram rejecter, has a throughput of over 30 pieces per minute with +/- 0.02kg accuracy. This large capacity checkweigher was built, tested, inspected, delivered and training completed within budget and time-frame. Real time monitoring of product weight deviations, and efficient weighing technology significantly increases the speed and precision of the entire production. Improves QA & QC reporting – able to record and store the weight of every product. Audio guidance support via the user-friendly touchscreen interface facilitates smooth production runs. Moderates overfilling and wastage to improve profit margins and reduce giveaways. Outstanding value for money and peace of mind. 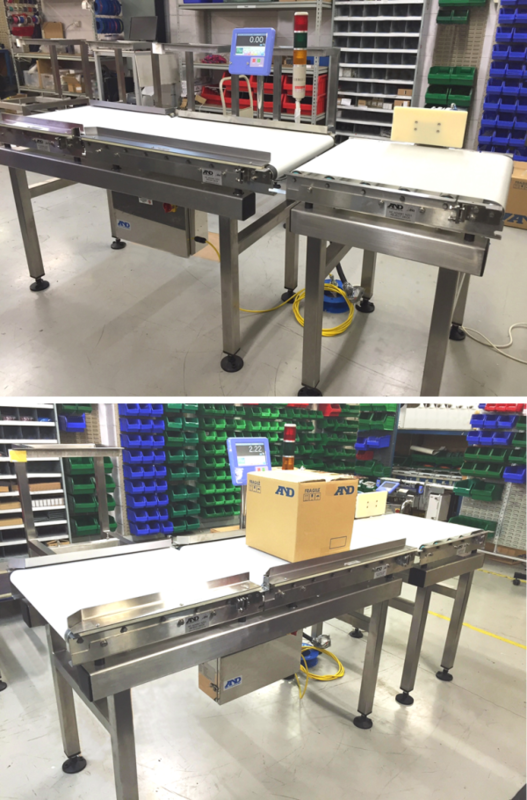 This is an example of A&D Australasia continuing to provide high-quality inspection solutions to industries in Australia and New Zealand. Contact us to find out how we can help you with your requirements.